Last Tuesday Mumeishi dojo enjoyed a visit from two 8th dans, Takatera sensei, Meiyo Shihan of the Imperial Palace Police and the well-known teacher and writer Ozawa Hiroshi sensei . 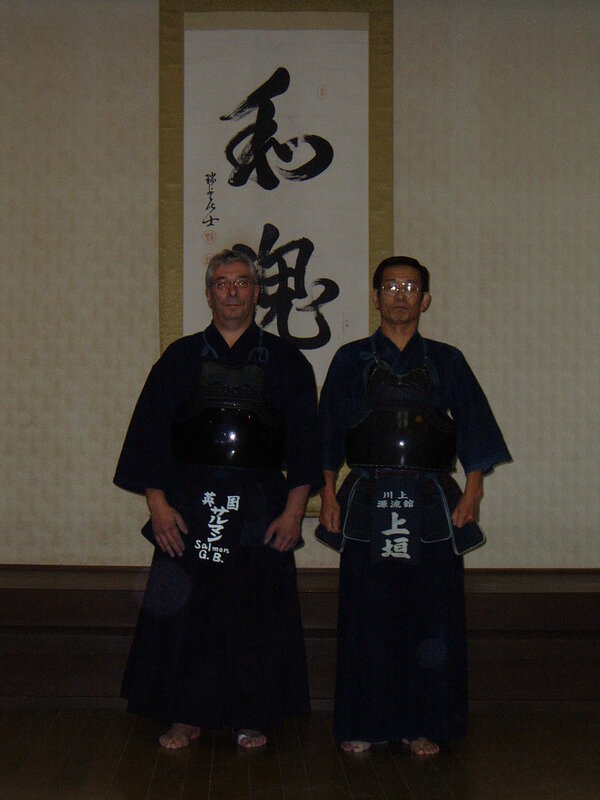 They were accompanied by a third teacher Iino sensei, a senior kyoshi 7th dan. The dojo was packed tight with students who came for the privilege of keiko with these excellent kenshi. 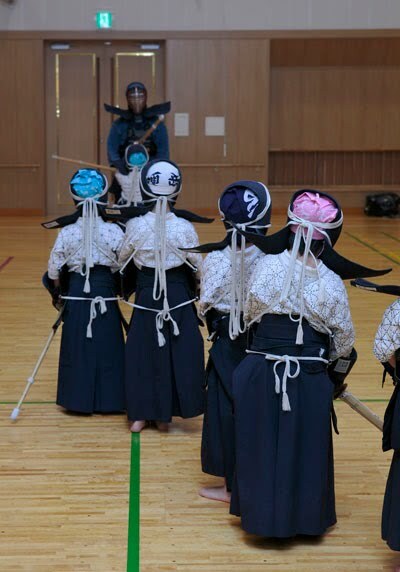 We had our usual kihon session then an hour of free keiko, so I made sure that I had my men and kote on quickly and was the first to practice with Takatera sensei before joining the line for the other two teachers, finally moving back to the motodachi side. Although in his 60s, Takatera sensei is a remarkably fast, forward moving 8th dan. When you face him the pressure is intense. 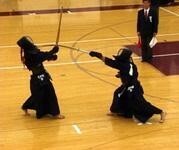 He very quickly “took me apart” before leading me through kakarigeiko and kirikaeshi. Different hachidan have different approaches to practice with older opponents and Takatera sensei’s is obviously to expect them to work hard. The sessions with the next two sensei were almost relaxed by comparison. 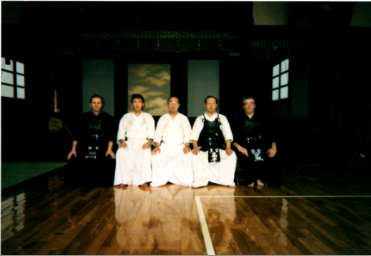 There is a temptation for senior grades to stay on the motodachi side of the dojo and not take advantage of these occasional chances to learn from more experienced teachers. If you are over 60, many Japanese instructors are relaxed about whether you join them for keiko or line up next to them. Whatever your age and grade you owe it to yourself to take every opportunity to improve and if it means finishing the keiko with wobbly legs, then so much the better. When I joined Takatera sensei, who is as good natured as he is fierce, for a beer after training, he told me that even though he has retired from the Imperial Palace, he currently attends 15 keiko sessions per week, which makes my three seem decidedly lightweight by comparison.. Takatera sensei, along with some other notable teachers, works extremely hard at his own kendo practice and expects the rest of us oldies to work equally hard. So this was a timely reminder to keep up the intensity of my own training. For the rest of this week I have made sure that we make kakarigeiko more challenging and that I join in as kakarite. 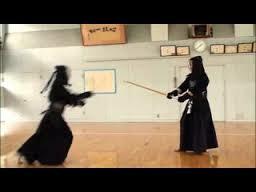 In kendo we use the expression “utte hansei, utarete kansha” meaning that we should learn by reflecting on the successful strikes we make and by showing gratitude for the successful strikes against us. I clearly have a lot to thank Takatera sensei for. * I will be away at the European Kendo Championships from mid-week until next Monday, so unless I can get my sausage fingers to work on a hand-held device, next weeks post will be late.